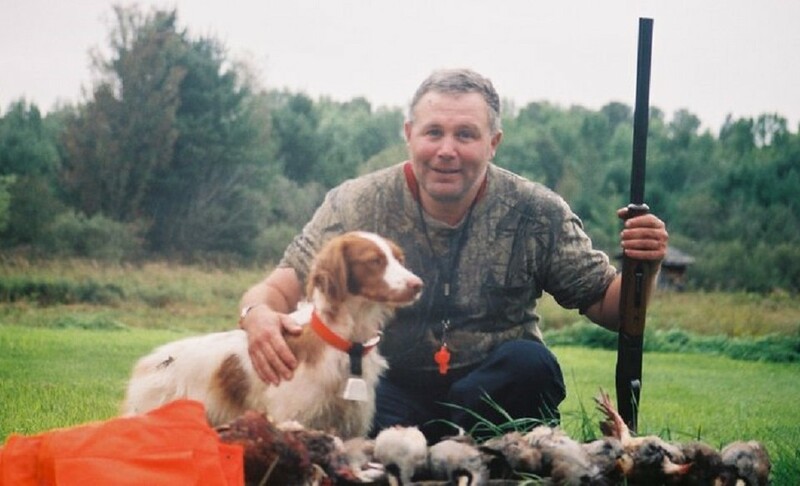 Often in the early season when I get out with my hunting buddies and our dogs game is scarce so the hunt is more an “armed run” with the dogs. 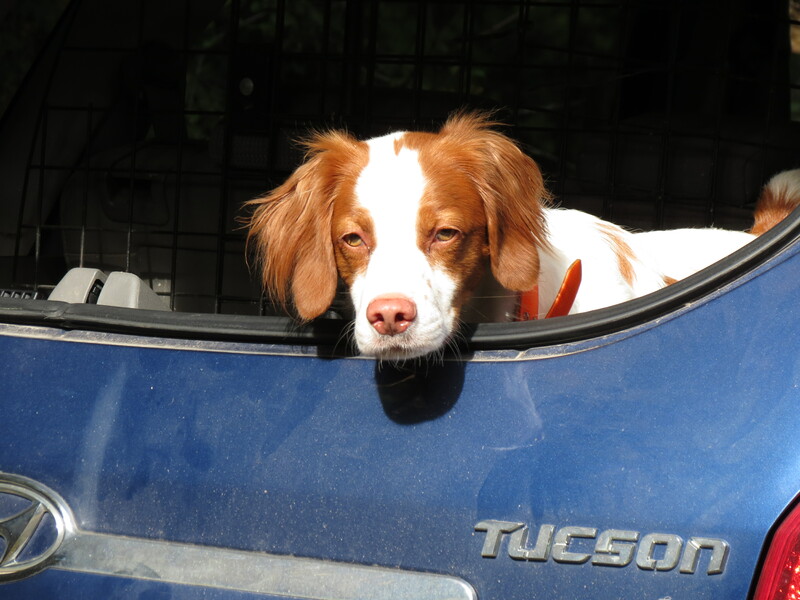 While we enjoy time afield with our dogs whether we turn up game or not, it is that much nicer for us when the dogs get into birds. This weekend I enjoyed upland gunning with birds a plenty. I set out Saturday morning, shortly after 7:00 am, with Hera to pick up my hunting buddy Omer and Ehtisham, a new friend of his, for grouse and woodcock hunt the Marlborough Forest. I got to Omer’s house at about 7:30 am and we were on our way. We went by way of Manotick, so we could hit the Tim Hortons on the way. On the drive into the forest we very nearly ran over a grouse standing on the trail. I braked in time and it took its leave in a hurry. We let it go and moved on. We arrived at the patch of cover I call “Lester’s Square” at 8:45 am. It was cool and sunny out (6 degrees C) and a brisk north wind was blowing, a little gustier than forecast to my dismay, but undaunted we set off hunting. Omer and his friend Ehtisham. We made our way along a familiar trail that leads to a patch of cover that usually holds migrating woodcock and the occasional grouse and hare. I was pleased to find the recent rainfall had the desired effect: the ground is moist and soft and the edges where we were hunting woodcock had puddles. Despite the favourable conditions, there were no points or flushes. The gusting wind made it difficult to hear Hera’s bell at times so we had to pay close attention as she quartered through the cover. 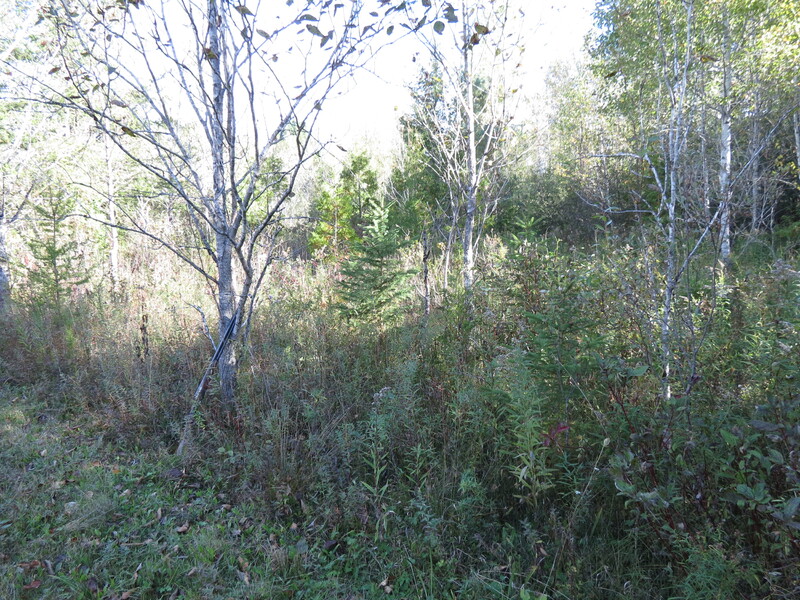 When we finished sweeping the first patch of cover, we made our way through a stretch of transitional habitat, a mix of cedar, hardwood and pine. Along the way a grouse flushed wildly from a tree, offering me a shot. I missed spectacularly. We carried on, walking abreast with Hera quartering ahead of us. Nothing was turned up. What I look for in grouse and woodcock cover. We crossed the meadow that stands between the transitional habitat and one of my woodcock hotspots, a nice patch of boggy lowland cover from which I took many woodcock and grouse in the years I gunned this cover. We found it is still dry; the recent rain failed to moisten the ground as I hoped. Not surprisingly, we found no birds, though Hera made a flash point on an old scent. We gave the cover and surrounding area a thorough sweep and found it barren. We let Hera cool off in a beaver pond as she worked up quite a sweat in searching grouse and woodcock for us. Hera cooling off in a beaver swamp. We made our way back to the car by 10:30 am and set out for another patch of cover in the Marlborough I call “Cowan’s Corner” in memory of an old friend who hunted the area for many years. When we drove in on the forest trail I noticed the ground was still dry. We parked next to a pond managed by Ducks Unlimited Canada and set out across a meadow to walk a hedgerow surrounding the remains of an old rail fence. 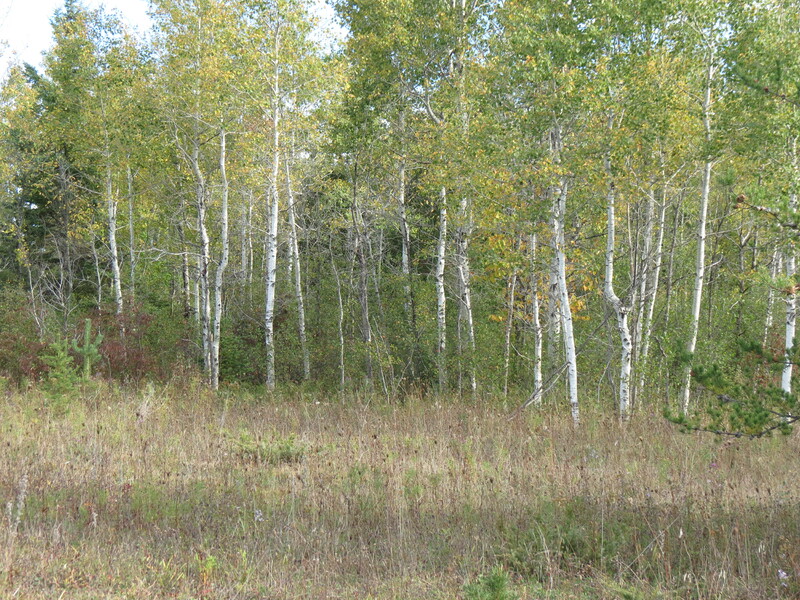 The hedgerow has chokecherry and birch among the shrubs and trees growing over the old fence. This is often a good place to surprise a grouse. Nothing was seen, but as we moved on to a trail with pines on one side and a stand of cedar and hardwood on the other a grouse flushed wildly in front of Hera and me. I directed Omer and Ehtisham to walk the trail, while I took Hera into the cedar and hardwood thicket in hopes of finding another grouse. I know my way through this thicket and where to exit further along the trail. Still no more birds were found. I emerged from the thicket, joining Omer and Ehtisham and together we walked the trail a while longer. The ground was dry and the wind continued gusting, so I suggested we head back to the car. 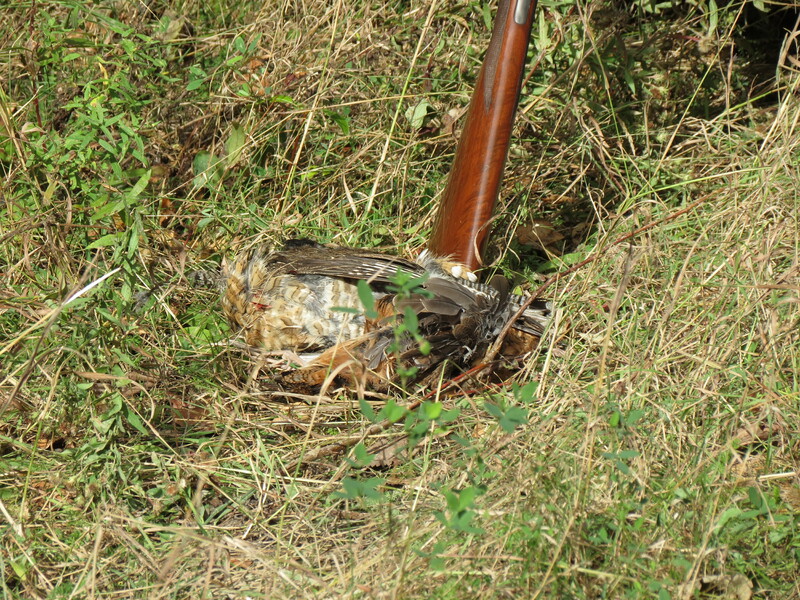 As we made our way back the way we came there were two more flushes, grouse flushing wildly. Then, as we reached the hedgerow we swept on the walk in, Hera caught the scent of a bird and pointed. It was a running grouse, so she carefully crept forward, trying to find it without bumping it. Ehtisham was walking point, so I gave him the nod to walk up Hera’s point. As he walked in, the grouse lost its nerve and flushed. Ehtisham got a shot off, but missed. Still it was a good point and an exciting moment for him. At 12:15 pm we concluded the hunt. There were no birds in the bag, but it was a good outing. Sunday morning I set out with Hera at 7:30 am for a farm near Spencerville where my buddies and I have permission to hunt. This time it was just Hera and me. Today it was cool and sunny and the wind was much lighter. I stopped for a coffee at Tim Horton’s en route and arrived at the farm close to 9:00 am. I noticed on the drive there that the service station in Spencerville is undergoing renovations and the gas pumps are not in service. I am used to filling up in Spencerville. Fortunately, I had plenty of fuel for the drive home. I stopped in and had a cup of coffee with Peter, my host, and we chatted briefly about this hunting season. I finished my coffee and parted company with Peter as the football match he had on tv was about to get underway. Hera was raring to go and off we went. Good grouse cover found on farmland. 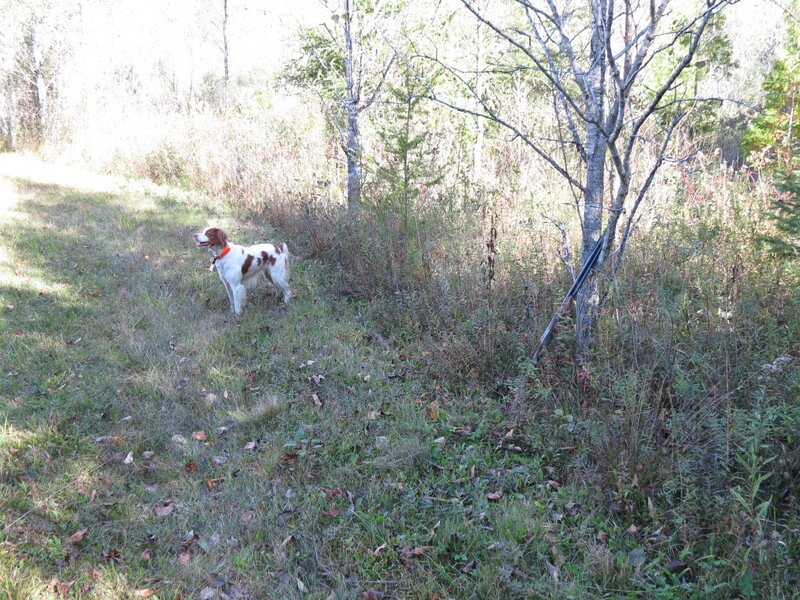 Hera standing by the spot where we took the first grouse of the season. We spent the next hour and a half sweeping the rest of the property. No woodcock or snipe were found, but I found our trail cameras and deer stands were undisturbed. We made our way back to the area where the grouse was taken and a second bird flushed wildly. This time it did not offer a shot. We made our way back to the house and I said thank-you to Peter before departing. I set out for Lester’s Square, hoping to get into some woodcock later in the morning. Along the way, I stopped to fill up in Kemptville. We arrived at Lester’s Square close to noon. As I anticipated, there was no one else there; Hera and I had the cover to ourselves. The temperature was rising, so I decided we would focus on the most likely spots to turn up woodcock and keep close to the beaver pond so Hera could cool off as needed. We headed to the first patch of cover, the same one as the day before, and sure enough this time Hera locked up on point on a clump of cedar. I’ve hunted over four Brittanies in my lifetime and I recognize by their posture different types of points. Hera locked up, but had her head up, looking very alert, meaning “there’s a bird close by, but I have not quite pinned it down.” Recognizing this, I walked several yards ahead of her in a roundabout route trying to get the bird in a squeeze play. Hera then carefully edged forward, tracking the scent. When she locked up again, I stepped forward and a woodcock flushed. I had to step into position for the shot, but dumped it cleanly. Hera made a great point on a woodcock hidden in this clump of cedar. This time Hera gave me the bird without a fight and we moved on. We swept through a patch of cover he left untouched the day before. 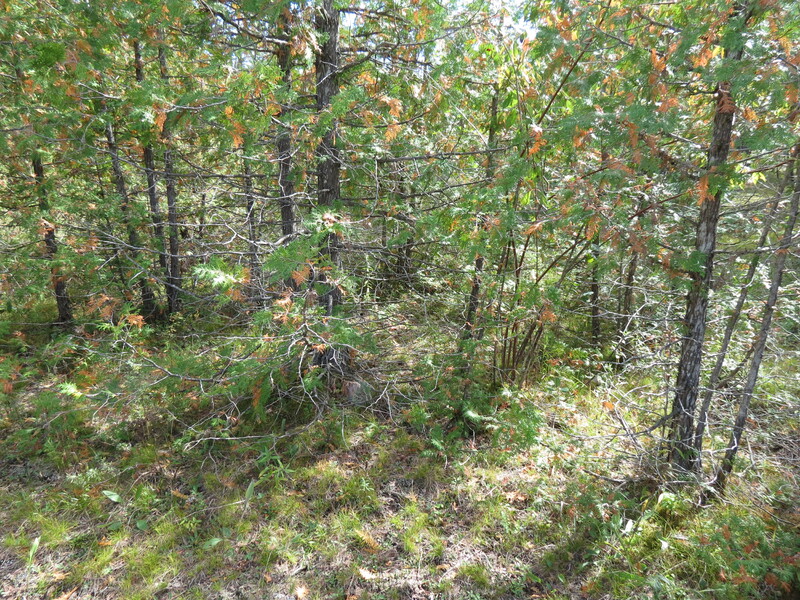 It is a denser patch of cedar on boggy ground. Before long, Hera locked up on point and as before we worked the squeeze play on the bird. Only this time, the woodcock put the cedar between me and itself when it flushed and made good its escape. We pressed on through the cover and once more, Hera locked up on point. I walked up her point and a woodcock flushed. This time I had a clear shot and did not miss. By then it was after 1:00 pm and quite warm. We made our way back to the car and en route Hera pointed an old scent. There was no bird. Once I had her on board, I gave her some water. We wrapped up the hunt and headed home at 2:00 pm. 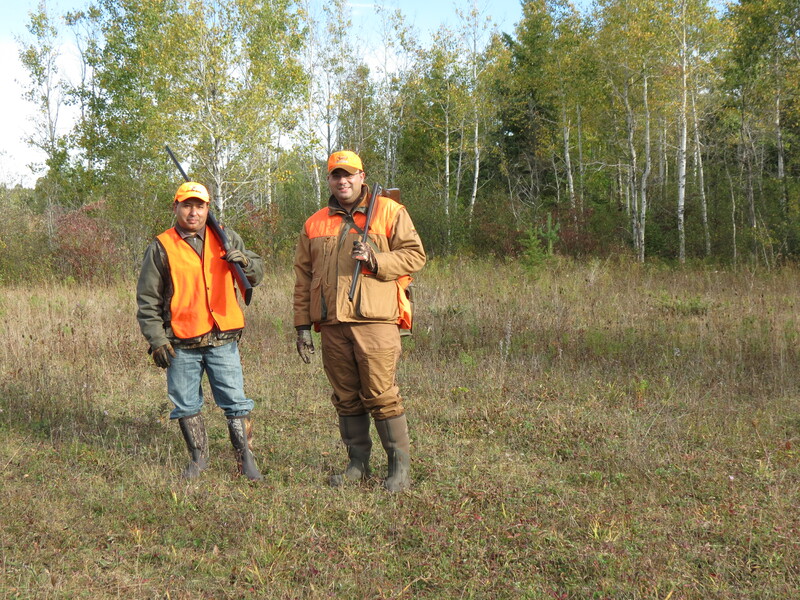 It was a great weekend of upland gunning. 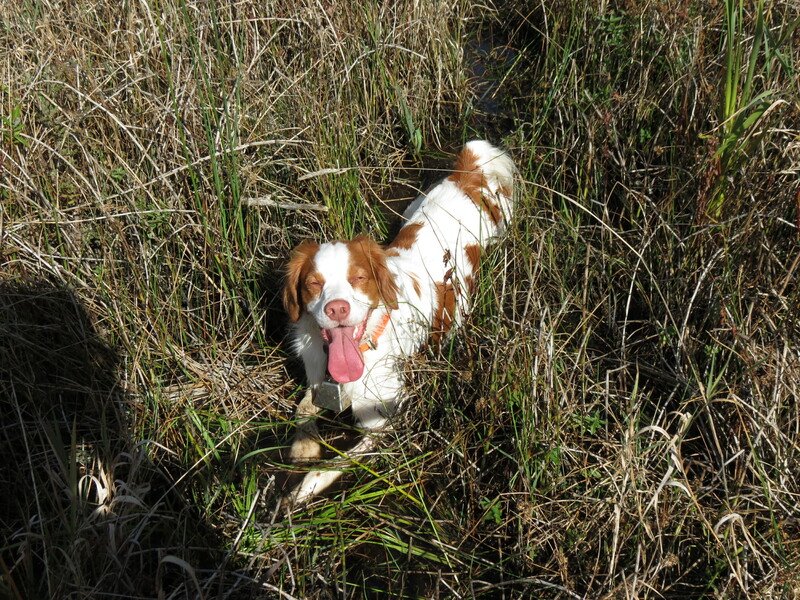 One happy and tired Brittany after a day’s hunting.